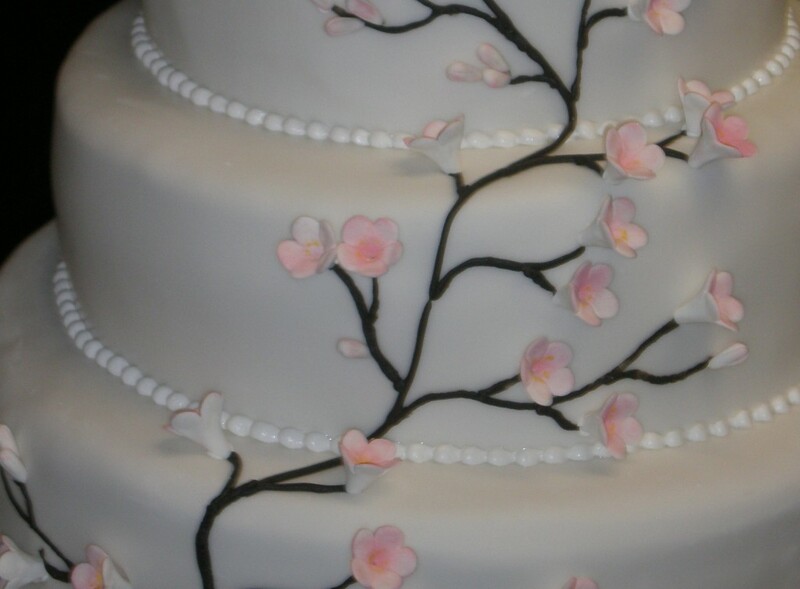 The most classic and elegant wedding cakes are iced with white or ivory fondant icing. Whether you choose vanilla sponge, chocolate cake, red velvet, coffee and walnut or a traditional rich fruit cake, each tier will look the same from the outside so it is easy to mix and match flavours. Prices shown are based on 3 round tiers, the most popular option, unless stated otherwise. There is an additional charge of £25 per tier for rich fruit cakes. Fondant iced cakes last well, are easy to transport and easy to cut. There is no end to the range of designs and colours available as fondant is such a versatile icing to work with. Simply sketch something on the back of an envelope and send it in, I can do the rest! 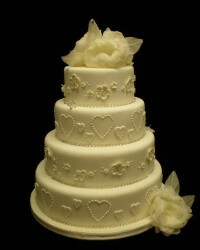 Wedding cakes were traditionally square, but it is incredibly unusual now to see anything other than round tiers. 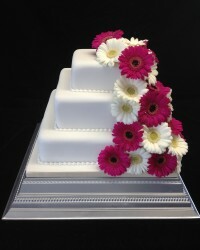 This design takes a traditional shape and gives it a really contemporary modern twist with bold fresh gerberas on a white iced cake. Square cakes serve around 25% extra guests as cakes are measured across their narrowest point, and there is also less waste in cutting. Additional £30/tier for fruit cake. 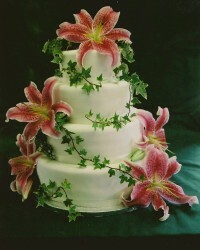 Round fondant iced cake simply decorated with fresh lilies to complement the bridal bouquet. The simple flowers in bold colours make a big impact. Additional ~£75 for a 4th tier. This is a great choice for pastel colour schemes, shown here in lilac, pale blue and white, with diamante detail on the ribbon. 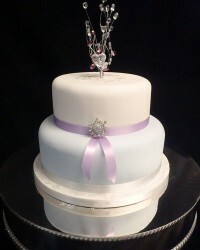 A fountain of glass effect hearts and crystals come from the top, with a shower of sparkles on the icing of the top tier. Additional ~£30/tier for fruit cake. 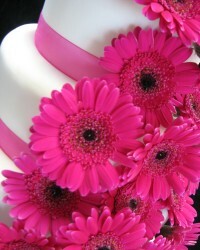 A vibrant design with bright fresh gerberas set onto smooth white fondant icing. The gerberas and ribbon can be any colour, and it is equally effective in pale muted colours or white and ivory. This is a great choice for lively, fun couples wanting to reflect their personalities through their cake. Additional ~ £30/tier for fruit cake. Two large tiers of moist chocolate cake to serve during the reception appear to be float above individual fruit cakes, each large enough to serve 4-6 guests. The individual cakes can be given as gifts to special guests to take home. Delicate sugarcraft flowers complete the picture. These can be kept as a keepsake. A simple design shown here in vibrant colours but just as effective and elegant in more muted tones. 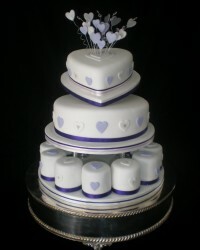 Tiers of sponge or fruit cake are covered in a perfectly smooth layer of white fondant and displayed on our Swan Stand. 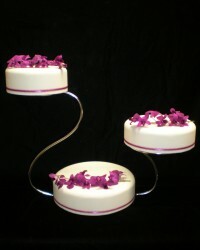 The tiers are decorated very simply with fresh vibrant orchids and either matching or contrasting ribbon. This is a great design for any one looking for a simple yet stunning design, and can be adapted for almost every colour scheme either using fresh orchids or other flowers. Each tier of this stunning cake is individually decorated and inspired by other aspects of your wedding – hearts, flowers,crystals, initials – making it totally unique to you, and an eye-catching centrepiece for your guests. This cake was finished with fabric flowers to match the wedding dress. A romantically shaped heart cake is set at an angle above a round tier with 12 individual cakes for each member of the bridal party nestled underneath, each perfectly iced with white fondant and decorated with tiny sugar hearts to take home and enjoy after the wedding. £545 including decoration as shown in any type or combination of cake flavour. 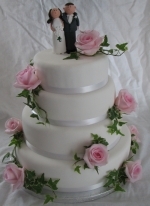 A simple and elegant design; pure white fondant, with bands of ribbon to blend in or to contrast, and fresh soft pink roses. Price for 3 tiers including fresh flowers ~£500. Bride & groom figures if required ~£25. An additional tier to make it 4 tiers is ~£75.